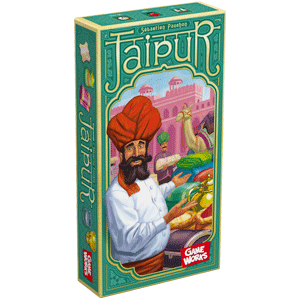 Work hard, earn more than your opponent and become the official merchant of the Maharaja. At the beginning of the game, three camel cards and two merchandise cards are on the table between the players, who already have five cards in hand. On your turn, you can take some cards or sell some. Each time that you take cards, you can take one or more, however if you decide to take more, then you will have to trade in the same amount of cards from your hand that you take. If you decide to take all camel cards, then they can be used later to trade. You can sell all the merchandise that you want, as long as they are all the same type. For each sale, you will receive tokens with various point values. At the end of the game, the player who has the majority of the camels also wins points.